...a governor of the workhouse be advertised for with notice that his duties must embrace the management of the Poor House, the collection of the rates, and the general discharge of the duties of the Overseer of the Poor. The salary, with maintenance and residence in the home, not to exceed £50 per annum. The applicant must be a married man of mature age without family, and be able to produce the most satisfactory testimony of his ability and character. County of Derby: Glossop, including Glossop Dale, Charlesworth Churnal, Hadfield and Dinting, Padfield, Somondley, and Whitfield (14); Ludworth and Chisworth (2). The population falling within the Union at the 1831 census had been 9,631. The average annual poor-rate expenditure for the period 1836-38 had been £1,075 or 2s.3d. per head of the population. The new Glossop Board of Guardians took over the recently built Township workhouse whose location and layout can be seen on the 1919 map below. The main workhouse building was a two-storey stone structure running east-west, with an extension at its western end. Glossop main building from the south, 2001. An infirmary was erected to the west of the workhouse. The original structure, dating from 1896-7, had 40 beds and cost £5,000. The building was greatly extended in 1926-7 at a cost of £7,500. 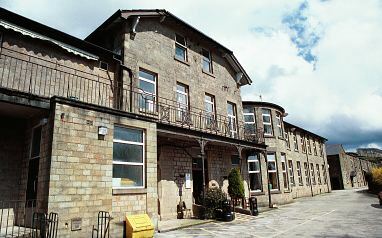 Glossop infirmary from the south-west, 2001. A new laundry was erected at the north of the workhouse in 1902, and the kitchens at the west of the laundry were rebuilt in 1920. Glossop laundry block from the south-east, 2001. Other buildings on the site included piggeries and casual wards for vagrants. It is believed, however, that tramps were sent to perform work in the adjacent quarry rather than in work cells in the workhouse itself. 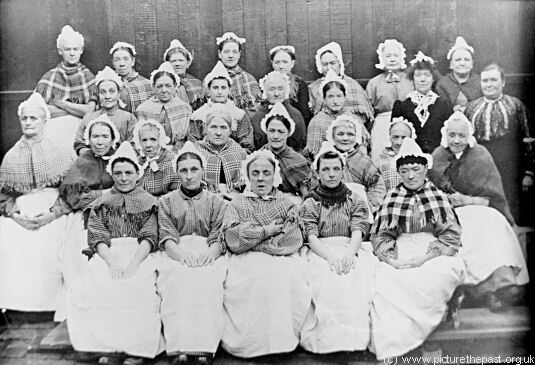 All workhouse inmates were required to wear a workhouse uniform, which for able-bodied women consisted of a blue and white striped dress, apron, shawl, and bonnet or cap which at Glossop had a distinctive pointed shape. At some workhouses inmates made their own clothing which provided useful work and also saved the union money. © Mrs E Bennet and www.picturethepast.org.uk. The workhouse later became known as Glossop Public Assistance Institution and then under the National Health Service as Shire Hill Hospital. Derbyshire Record Office, New Street, Matlock, Derbyshire. Virtually no local records survive.